Another cool gift card for the grand kids I keep hoping to win one of these! I already follow Totally Target on facebook! i would love to win this. and Thank You. i like on FB. I would love to win. I “like” totallytarget! Happy Easter! Thanks for the giveaway!!! 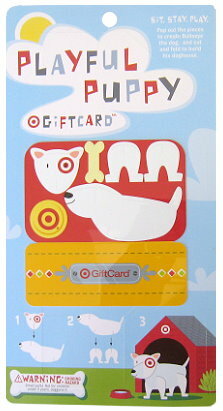 Would love that puppy gift card. Have a Great Easter. This is a very important holiday for me. It means hope. yea!! love this one each week!! thank u! like you on fb already! I “like” TT on FB…. I’m in to win, thank you! Happy Easter! I have “liked” Totally Target on Facebook a very long time ago. Thanks for the opportunity for a giveaway! I follow you on FB, thanks!!! I love your weekly giveaway! Happy easter would love to win! Thanks for always offering these! Happy Easter! I would love to win! Thank you for the great giveaways!!!! Happy Easter!! !